The Rainbow Loom is basically a grid of three rows of plastic pins. 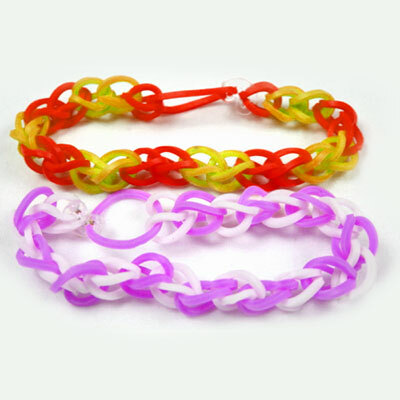 You can use the Rainbow Loom to make a wide variety of jewelry, like bracelets, rings, necklaces and earrings, as well as lots of other fun things, like Christmas ornaments, purses, phone and MP3 player cases and more. By looping elastic bands of assorted colors over the pins and the looping them over and under each other, you can create all these and more by using Rainbow Loom Patterns provided on this site and other places. All the patterns we provide on the site will include video walkthroughs, text instructions and even photos of the final product. If you’re a beginner to the Rainbow Loom, be sure and start with he Single Pattern. This is the easiest and will allow you to quickly get the feel for the loom, how the place the bands and how to follow our instructions. Plus you’ll end up with a cool bracelet in no time. we bought a rainbow loom and have misplaced the instructions. can you tell me where I can go to get a copy? You can find it on you tube. Yea it does need more dettail! Great page you are going to want to check this one out! I am using the pattern map but there are no names for the patterns. How are you supposed to find directions on removal without knowing which type you’re making? Please supply names for pattern map. Thanks! Our YouTube website is blocked! Any suggestions? I looooooooooooooooooooooooooooooooooooooove this site so much!!!!!!!!!!!!!!!!!!!!!!!!!!!!!!!!!!!!!!!!!!!!!!!!!!!!!!!!!!!!!!!!!!!!!!!!!!!!!!!!!!!!!!!!!!!!!!!!!!!!!!!!!!!!!!!!!! Where are the videos and instructions for this site???? I’ve got a kindle fire and I can’t find the information! can you please put up instruction sheets not just videos?